"To the love of my life and the kindest gentlest soul I know, a very, very happy birthday! 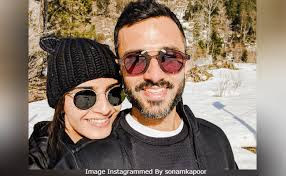 You make my world better and I'm so blessed you were born today," read an excerpt from Sonam Kapoor's post for husband Anand Ahuja's birthday. Sonam also shared multiple pictures from their trips and also took us inside Anand's family-only birthday celebrations. WhileSonam's sister Rhea gifted sneaker fan Anand a shoe made of flowers as birthday gift, his wife appears to have ordered a Los Angeles Lakers cake for him. Los Angeles Lakers is the basketball team which Anand Ahuja supports. In her post, Sonam also quoted Italian writer Luciano De Crescenzo and wrote, "We are each of us angels with only one wing, and we can only fly by embracing one another." She also added their wedding hashtag 'Everyday Phenomenal' and 'Always And Forever' to the post. "Every lifetime," commented Anand. Dear Anand Ahuja, here's Sonam Kapoor's birthday wish for you. Sonam and Anand are currently in New Delhi (his hometown) and Anil Kapoor, who with Fanney Khan promotions in the national capital, also joined the midnight celebrations. Mr Kapoor shared a cute photo of himself and Anand with a message for his son-in-law. "You've chased your dreams & now you're living them! Doesn't get better than this! Happy Birthday, Anand Ahuja. You are already having a hell of a year and I hope the coming years are filled with even more success & happiness! Never let that spark fade! Love always," he wrote. Sonam Kapoor married Anand Ahuja in May this year. He is the owner of fashion label Bhane and also runs a sneaker brand VegNonVeg.